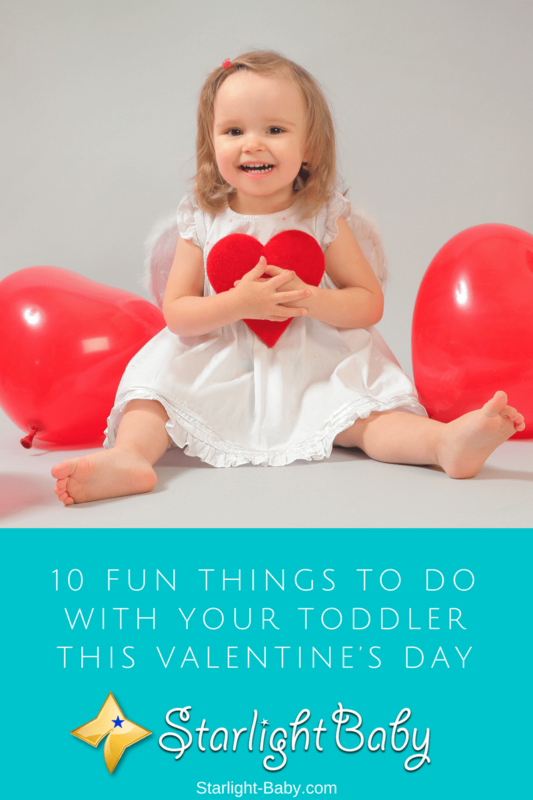 Are you looking for fun ways to spend time with your toddler this Valentines day? Although it’s typically a holiday designed to celebrate love between couples, parents can also use this special day as a time to educate and bond with their children. Whether you’re looking for craft ideas, games to play, or you just want to relax and bond with your toddler this Valentine’s Day, here, you’ll discover some of the best ideas you can try out. OK, so your toddler isn’t going to be able to understand a lot about love right now, but that doesn’t mean you can’t educate them. Toddlers love to learn, so you can use Valentine’s Day as a chance to educate them about what the day means. You can also use it to explain more about friendship. Start by sitting down and talking about what Valentine’s Day is and why it is celebrated. Then, you can move on to talking about the different types of love. Explain friendship, love between family and the difference between the two. You can then move on to explaining how you can show love, especially to friends and family. Educating your toddler on the concept of love is a great way to start your Valentine’s Day together. Which toddler doesn’t love Play-Doh? This fun, simple idea is guaranteed to keep them entertained for hours. You can either create your own Play-Doh, or buy it ready-made in red, white and pink colors. If you’re interested in trying to make your own, you can find an awesome recipe here. As well as the Play-Doh itself, you’ll need some Valentine’s Day inspired cookie cutters. You can also give your little one a small toddler-friendly rolling pin so they can roll out the Play-Doh (you’ll be surprised by how much they actually enjoy this). Valentine’s Day should be all about pampering and relaxing. However, that’s not exactly easy when you have a toddler! So, why not get them involved in the pamper session too? Obviously, if you have a little boy, he may not be totally into the whole pampering idea, however you might just be surprised! You can give your little one a mini pedicure and manicure. Little girls love nothing more than pretending to be grown up like mommy. Toddler-friendly nail polish will go down really well with your toddler and it’s something you can enjoy too. A mini pampering session provides an awesome bonding experience for you and your toddler and it will leave you feeling much more relaxed too. Another educational idea is the heart sorting game. It’s one of the simplest ideas on the list and your toddler is guaranteed to love it. All you’ll need is a few shoeboxes (or any other suitable empty boxes you can find) and some colored card or tissue paper. You may also find heart shaped cookie cutters useful for drawing perfect shaped hearts. Cut a variety of size hearts out and then get your toddler to sort them into specific categories. So, you could ask them to find pairs of the same size hearts, or the same color hearts. You could also use one box for each size heart and your toddler’s job is to match the size with the right box. This is an awesome way to teach your little one pre-math’s skills. On Valentine’s Day, couples generally enjoy a nice romantic meal together. Well, why not start a tradition where you enjoy a nice special family meal? Your toddler could even help you prepare it, making it more likely they’ll eat it later on. You could make it super-fun for your toddler by shaping some of the food into love heart shapes. If you’re not sure about getting them to help you make the main course, why not get them to help you with the dessert? Baking is always fun for toddlers and they’ll enjoy making Valentine’s Day inspired cakes with you. Of course, one of the most popular Valentine’s Day activities is creating cards with your kids. Why not help your toddler make their own cards? This could be done before Valentine’s Day arrives, or you can make them on the day and then visit friends and family to give the cards out. Your little one will be so proud that they managed to make a card and give it to friends or family. If you’re struggling to fill the day with activities, why not have a singing break? You could even break out into a little dance with your toddler if you want to ramp up the fun level! If you want to stick to a Valentine’s Day theme, sing love songs together. Your toddler will love a little sing-along session and it’s great for you too. Singing and dancing is a great way to get rid of stress and tension and it also provides an energy-boost when you most need it. So, put a Valentine’s Day playlist together and enjoy singing along with your little one. Discovery boxes always go down a treat with toddlers and this Valentine’s day edition is going to be no exception. You basically fill a box with paper hearts, photos and silk flower petals. Now, while filling the box with individual hearts, petals and photos is a good enough idea in itself, to make it even more exciting, why not add the photos to the back of some of the hearts? That way, you could ask your toddler to find the photos. You’ll need lots of paper hearts for this version, and some of them should be blank. This helps to build up your toddler’s concentration and they’ll feel a sense of achievement when they do find the photos. Just be careful not to provide too many empty hearts as this could actually frustrate your little one if they keep finding blank ones. Capturing photos of your toddler is something you likely already do, but Valentine’s Day gives you the chance to make it extra-special. Why not dress up or create a Valentine’s Day themed backdrop for the photos? Your toddler will love getting dressed up and you can save the photos forever. You could even turn it into an annual tradition and compare the photos each year to see how much your toddler has changed. Finally, what better way to celebrate the day of love than by doing something nice for somebody else? While kindness is something you’ll always want to teach your child, it doesn’t hurt to make specific days a time for giving. You could teach your toddler the type of things you can do for others to show love. For example, you could visit their grandparents, help out a neighbor or get your toddler to give friends or family a gift. While toddlers aren’t always great at sharing, they do like to make others happy and it’s an excellent time to show them what it means to be kind. The above are just 10 great ideas of fun things to do with your toddler this Valentine’s Day. There’s plenty there to keep you and your little one entertained all day. Have you got your own tips and ideas other parents may enjoy? Do us all a favor and share them below! My baby will be just 10 months old this Valentine’s Day. He is too young to understand about valentine’s day, however, he sure understands love. he is attracted towards bright colors, especially red. Therefore, I am thinking to buy him red colored soft toys. I have 8 years old nephew and 6 years old niece. I am thinking to buy them some valentine’s day gift. Valentine is all about love, so it’s paramount to shower all sorts of love in ways that would make you toddler happy. I would add buying of gifts, probably toys for him or her because it certainly puts a huge smile on their faces. Although this year’s valentine’s day fall on Ash Wednesday, it would also be nice to go to church together and apply ash on their forehead as well as take group and individual photos. For parents who give their child unconditional love, every day is Valentine’s Day because parents do everything for their child with love. A lovely toy for your little one is also a nice idea. It would make the day more love-filled than usual. Of course yes, you are correct in saying that everyday is a valentine’s day from a parent to their kids. Nothing in this world beats a mothers love for her child. A mother is actually willing and eager to give her life for her kid, in my opinion there is no love above that. Enjoying meals together can be a good way to share love during this time of Valentine and doing so with your toddler involved is a great way to have a fulfilling session. I’ve always said that talking with our little one can be a great way to bond well with them as well as make the Valentine day I special one. I always enjoy mom and dad taking me out while I was a toddler in those days. True! Having lunch or dinner together as a family during Valentine’s Day is a wonderful idea because dinner dates are not only for sweethearts but for families who want to get together as well. And yes, like you, I also have fond memories of my grandfather taking me out to lunch every time he receives his monthly pension. I always look back at those days with loving thoughts. It was one of the most memorable moments in my life when I was growing up. This was what I am saying in the sense that spending some quality time with your family on the day of Valentine is one that might look simple on the surface, but have lots of significance. It is building memories and boding together and I have a slogan that a family that eats together loves more! I completely agree with you on this, sharing meals together intensify the bond in the family. It makes everyone cherish one another and feel loved. In the act of eating together, try feeding each other as well, it gives joy to eat from the hands of your loved one. Throughout my childhood years, my parents brought my siblings and I up to eat together in one plate. I actually felt odd the day I was dished my meal separate and actually asked my mother why, she told me that I’m not a kid anymore. When my son is about three years old, I’d prepare something for our holidays like Valentines or Easter or Halloween. nothing so fancy but a special meal prepared and arranged extra special for the family dinner. Also, I’d prepare a craft and make some cards and decorations that he can cut and glue. It never occurred to me that we can actually do something good to others. Not just every Christmas season but we can use up the events like this to spread the love and show them how we can care for others. Thanks for this list. I just helped my 5 year old son to write his teacher a card for valentine’s day. While he was doing it, he just started asking questions, so many questions and some were even funny. It is just now as I read your blog that I realized I had a good conversation with him about love, friendship, sharing, giving, being kind, being compassionate and so many things. So, yes! talk about love with your kids is a happy time. I commend you for teaching your child the power to be creative, the thing is that such kids that are given little responsibilities while still kids tend to achieve greater things in life for they will look for ways to get better at what they do. My daughter just turned 5 and itwas an awesome Valentines Day with her! I wasn’t in town last year and previously she was too darn young to get it …But yesterday we had a blast. She loves to paint so I bought her her very own canvas and brush set. She usually has to use my brushes and we reuse old canvases with less than stellar paintings on them so she has gotten used to painting over stuff. When she saw that she got a brand new white canvas..Oh man. PRICELESS. If you love your child every day is a special moment and day for that child and you as the parent. Finding great things to do with your child that will teach him or her how to become creative and find the things in life that they enjoy is a great compliment as a parent. Because Valentines Day is all about love, it gives you the perfect opportunity to create more love in your family.When children feel loved, it builds confidence and resilience. So I think it’s perfect in their own world to make them feel its deeper love. I can’t wait to try all or some of these with my toddler when I have one. Just being able to share a day filled with so much love with them makes my heart warm. I might be wrong about this but I think babies/toddlers have the purest hearts filled with the most love. Innocent, beautiful, unconditional love. I’m already tearing up haha.